If you are looking to add more non-fiction to your collection, then look no further! Well...look further than this book but definitely add this one to your collection. 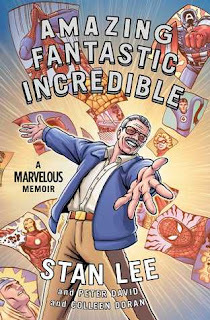 Stan Lee, creator and Marvel characters Spiderman, The Hulk and the Fantastic Four has FINALLY created a comic book memoir of his life. Starting with his very humble beginnings, he narrates his life from there and his journey through the halls of comic bookdom, including some amazingly talented people he was not only able to meet but work with as well. He tells about his stint in the military during World War II writing beside the likes of Theodor Geisel and other notable cartoonists that would become famous in their own right. Lee also lovingly shares the story of his romance with his wife of six decades and the reader is able to see how their relationship had an impact on Lee's professional career. He takes us all the way to present day where people watch for his cameo appearance in any Marvel movie. What made Stan Lee such an icon is the fact that he changed the face of comic book writing, broke through some huge barriers put up by corporate suits and federal laws (on comics, of all things!) and continued the popularity of comic books from page to screen while continuing to write to audiences ranging from children to adult. And if you think this is just another memoir, think again. Lee manages to expertly weave the history of Marvel Comics from page to screen and beyond so the reader not only gets a glimpse of his life, but a timeline of Marvel from its early beginnings to present day. Another interesting facet of this book is the narrator himself. Yes, it's Stan Lee (and artist Colleen Doran did a stellar job of creating real life superheroes...got to see it to understand what I mean) but in the audience is a little boy who is fascinated with his tale and inserts himself into Lee's narration. Lee knows that little boy well because....it's himself. He weaves narrator and audience into a beautiful story of past and present which any comic book fan will devour. Highly recommended by JH/HS and beyond. As only Stan Lee can do so well. Jill continued to live with her mother after the divorce. It's not that she doesn't love her father...it's more that she doesn't belong in the new family with the big house and new wife. Jill knows her father supports her, financially, if not emotionally, and she's relying on this for her future. Jill has always been a dedicated student and Ivy League college is waiting for her after graduation. Simone's life is much different. She doesn't have the financial support to be able to leave after college. And....she hasn't always been the most studious of girls. What Jill has in academics, Simone more than makes up for in popularity. People are naturally attracted to her and because of this, Simone knows how to work a crowd. Both girls were excited to go on a study abroad program in Italy sponsored by their school. Now, after the trip, Jill is recovering in a hospital, her memories affected by aphasia. Simone didn't come home. An incident involving both girls only left one alive. But Jill isn't only plagued by aphasia. 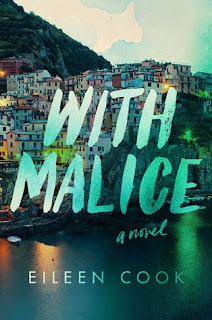 She is being investigated by the Italian police in a murder case, where she is the leading suspect in the murder of her best friend. One intentionally wrecked car, one knife, two girls. Jill isn't only surrounded by her family, but also by lawyers and a media team, trying to repair the negative reputation she is getting on social media. Now the Italian police want to extradite her back to Italy to possibly stand trial. Her future is slipping away from her. Slowly, the investigation begins to open wider and people are coming forward with eyewitness accounts of the girls friendship turning ugly as well the involvement of an Italian with a sketchy background who became involved with both girls. And slowly, Jill is beginning to recall what really happened. Suspenseful, intriguing, provocative. Cook writes a novel filled with all of these components as well as some very interesting characters. The reader won't know who to trust because of the secrets and lies everyone is telling. Or are they truly lies? That's what so amazing about this book- there are such subtle twists and turns the reader won't know the truth until the very end. And when they get there, they will be stunned. And THAT'S what makes this a great YA read! Highly recommended. 1. We aren’t always reading. We do have a social life. How we conduct ourselves professionally isn’t always how we conduct ourselves personally, and don’t EVEN start stereotyping that right now! Nor do we catalog everything in our pantries, chest of drawers, or our mailbox. We go out, have fun, socialize outside of our library circles, and have some of the most amazing hobbies ever!! Discover & Share this True GIF with everyone you know. GIPHY is how you search, share, discover, and create GIFs. Discover & Share this Digg GIF with everyone you know. GIPHY is how you search, share, discover, and create GIFs. 3. Silence isn’t our closest friend Believe it or not, libraries have areas where people can actually talk and work together. And no, we don’t mind it. Learning involves conversations, so the shushing has slowed its roll. Discover & Share this Comic Con GIF with everyone you know. GIPHY is how you search, share, discover, and create GIFs. 5. We work in a library, a libratory, a makerspace, a learning commons space, and a safe haven. So that makes us librarians, libraritorians, makerspace-ites, learning commonistas, and a safe haven. Discover & Share this Rasalo GIF with everyone you know. GIPHY is how you search, share, discover, and create GIFs. 6. We don’t like to be the lone wolf. In fact, we thrive better when we are working and collaborating with someone rather than winging it alone. We may be the only librarian on campus, but don’t put Baby in the corner! Discover & Share this Patrick Swayze GIF with everyone you know. GIPHY is how you search, share, discover, and create GIFs. 7. We want everyone to know the truth! Especially about the internet! Knowing how to distinguish between what’s fact and what’s fiction is important to know! Databases are only part of it…we can show you the bigger picture! I promise, I’m not shouting, I’m just enthusiastic! Discover & Share this Aladdin GIF with everyone you know. GIPHY is how you search, share, discover, and create GIFs. 8. We are flexible. Not only can we walk into an English classroom with the confidence of a superhero, but we can do the same in a science, history or math classroom as well. And that doesn’t even include all the other subjects, which we can handle hands down. Now, THAT’S flexible! Discover & Share this Gymnastics GIF with everyone you know. GIPHY is how you search, share, discover, and create GIFs. 9. Librarians aren’t just about books anymore. We love..nay, we crave technology! We try to stay up with the latest trends, resources and implementation of technology to make sure you have the newest and best information out there. The hum of a computer hard drive accompanied by the tapping of fingers on touch screens are music to our ears! Discover & Share this Technology GIF with everyone you know. GIPHY is how you search, share, discover, and create GIFs. 10. We are networking fools! Not only do we love to collaborate, we also love to learn and share too! Doesn’t matter…if you get two or more librarians in a room together, it’s the beginning of an audacious networking party! Want More Cool Quizzes for the Classroom?